This article originally appeared in our 2017 Shootout issue. If you are interested in seeing more stories like this, click HERE to subscribe. We love to get our hands on new models and that’s exactly what this Retreat is. It’s a brand-new line of pontoons for 2017 that has this veteran manufacturer excited, and we can see why. Starting with the exterior, the black and bronze panels tie in well for a solid high-end look and the LED docking lights are a nice added touch. As you make your way inside the boat you’re greeted with an upgraded teak-looking vinyl floor and a black lid for the in-floor ski locker that inside is 6 feet long and over 15 inches deep. In the bow are two plush-looking chaise lounges with storage below. Like the outside panels, the furniture vinyl is also two colors with tan or light sand being the dominant color and brown as the accent. The helm console also has a soft vinyl wrap with a stitched brow on top and the dash includes two large multi-function gauges with Tiplit toggle switches on the right. As part of the Marine Audio sound system is a 12-volt outlet and USB/Auxiliary port so the driver can stay connected. Four speakers come standard, but on this particular model there is an additional subwoofer to really help you get the most out of the stereo. For the captain is a high-back chair that slides, swivels and reclines and other than it being on an elevated platform, the first-mate chair directly across is identical. In the stern are two rear-facing lounges that are just begging to be used; in fact, when the family goes to “retreat” these will arguably be the most popular. Like all the other seating, there is ample storage below each lounger, proving you really can’t have too many places to store your gear. Outside the stern gate is a large ski/tow bar on the swim deck along with a black powder-coated boarding ladder that matches the exterior of the boat. The four-step boarding ladder has extra-wide handholds and is extra deep to help get you back in the boat safely. Other features and amenities we like include the Plexiglas table with cupholders, matching snap-in flooring on the raised helm platform, a 9-foot Bimini top and an extra-wide side gate that at 32 inches is plenty wide to be considered wheelchair-accessible. With the High Performance package you have a third 25-inch-diameter pontoon with lifting strakes on both sides of the center tube and on the insides of the outer ones. You also gain a 50-gallon fuel tank and the cross members are on 16-inch centers. Up top there is over 19 feet of deck space between the bow and stern gates and the rail height measures 30 inches tall for the majority of the boat before dropping slightly to 25 in the stern. We just missed the 40 mph mark at full throttle with the Mercury 200hp four-stroke on the back. The maximum horsepower rating on this new model is 250hp, but we feel as-tested it has plenty of power. She banked slightly in the sharp turns and overall was quite responsive and fun to drive. We found a lot of added value in this Lowe Retreat that is going to appeal to a lot of families—as well as a lot of budgets. It’s a great all-around pontoon with a nice balance of standard and optional features. 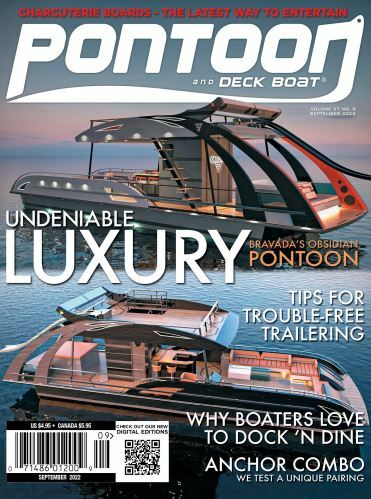 Of course this manufacturer offers a wide variety of pontoon models across its impressive lineup, but we’re always excited to get our hands on brand-new lines to test—especially when they turn out as well as this new one. Why we love this boat…Plenty of added touches on this particular model, but it’s probably the value with the budget-friendly price tag we like the most. Just being picky…We’d love to see some type of a glove box or small storage compartment for the driver to put loose items. Raised fiberglass console w/ integrated kick panel, tinted windscreen, Tiplit toggle switches, 4:1 anti-feedback steering, polished aluminum steering wheel, bow and stern mooring cleats, heavy-duty 9-foot Bimini top w/ boot and quick disconnects, custom Plexiglas table w/ cupholders, stainless steel cupholders, and full deluxe vinyl flooring. Trailer, hydraulic steering, marine stereo system (app-ready w/ 5-channel D5000 amp, 4 speakers, and subwoofer), full Supreme teak flooring, underwater lighting, reversed ski/tow, and full cover.